BATON ROUGE — On Tuesday, the 6th month anniversary of his swearing in as Coroner, Dr. 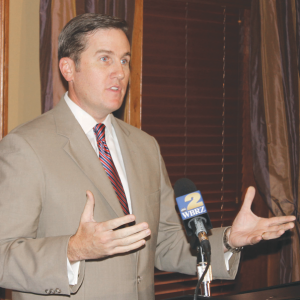 Beau Clark addressed the Chamber of Commerce of East Baton Rouge on the parish’s soaring murder rate. He spoke earnestly about the 84 murders that had been committed in East Baton Rouge Parish through 12 noon that day. But after he left the meeting, Dr. Clark learned that, during his speech, the 85th murder had occurred. East Baton Rouge Parish has never experienced 100 murders in a single year, but Clark said that, with the 4th quarter still ahead, the parish could far exceed that total. At the current rate, EBR will have 113 murders by year’s end. The coronor said he was interested in pathology long before he became a physician. He was an emergency room doctor, a City Policeman, and a SWAT team member before becoming Coroner. As coroner, Clark is responsible for every autopsy of a suspected homicide and for determining the cause of death, not only in the case of murder but in the case of every death in the parish which does not appear to be of natural causes. “With 450,000 people in the parish, we have about 4,500 deaths a year, and we look at about 3,000 of those,” he said. In addition to investigating deaths in the parish, the coroner is responsible for investigating sexual assaults and for civil commitments and mental health, which actually consume the largest part of his work. Dr. Clark said deaths can be classified as natural or unnatural. Unnatural deaths include homicides, suicides, accidents, and undetermined. Homicides involve one person taking the life of another. Some homicides are determined to be justified or accidental. Dr. Clark said that before 2006, the number of murders in East Baton Rouge Parish rarely exceeded 60, but they rose to 90 by 2011. With one-fourth of the year remaining, it appears almost certain that number will be far exceeded. The coroner said it is difficult to know how much of the increase can be attributed to the influx of people after Katrina but he said it is common for his office to locate the next of kin of the deceased in New Orleans. The coroner said that he has increased the number of investigators in the office from three to seven with no increase in his budget. He said he did this by moving personnel from administrative to investigative positions. Dr. Clark said many of the murders in East Baton Rouge Parish can be attributed to the drug trade. Some times drug dealers gun down their competition, he said. Retaliation is also a major part of the problem, he said. “When we have a murder on a Friday night, we often see a retaliation killing by Sunday morning.” The second person killed may or may not be the shooter in the first case, he said. “Often it is a member of the shooter’s circle, perhaps a cousin,” he said. Guns are usually the weapon of choice in murders here, he said. Aggressive law enforcement is one of the answers to the problem, he said. “We need more police officers on the streets. We have to shut down the drug business in our community,” and make drug dealing too risky to pursue in the parish. Murder victims in East Baton Rouge range from those who are completely innocent to those who are themselves murderers. Likewise, the reaction of the deceased’s family ranges from complete and utter devastation to disinterest. Dr. Clark recalled with emotion the case of a man gunned down in the middle of the day as he was walking along the Interstate. His mother came to the crime scene and in her grief fought to cross the police lines and get to her son. “It was a chance to put my hand on her shoulder and attempt to comfort her in the most difficult time imaginable,” he said. Although Dr. Clark did not speak of other cases, sources who previously worked in the office said that sometimes the family of the deceased wants nothing to do with the body. “Often the deceased is a criminal whose family has been his greatest victim,” one said. Dr. Clark said more than ever young people need good public schools to attend and good role models to follow. As coroner, he also investigates suicides in East Baton Rouge Parish. There were 43 suicides in the parish last year, he said. “We have had 34 suicides so far this year with three months to go,” he said. • Regional autopsies. The Coroner’s office is performing autopsies on behalf of surrounding parishes. • Clearing Warrants. His office has helped clear 798 warrants by merging databases and clearing warrants against the deceased. • Organ Donation. The coroner’s office has arranged 700 organ donations from deceased persons. • Prescription Donation. The coroner’s office has arranged the donation of more than 10,000 prescriptions to non-profit organizations. Dr. Clark, who was accompanied to the Chamber EBR meeting by his father, Roger Clark, urged the small business owners to keep standing up against crime and violence.